Innovative tensegrity stand and inspired cabinet design elevate this standmount to premier league status. Exquisitely designed, superbly finished, ingeniously engineered, Q Acoustics Concept 300 is the kind of Hi-Fi loudspeaker that gives high-end audio a good name. Its hyper-glossy cabinet and spectacular tensegrity tripod stand aren’t just about scoring a cosmetic bullseye, they also contribute to a startling sonic performance. Spoiler alert, yes, these are mighty fine-sounding speakers. Perhaps the surprise is they come from Q Acoustics? After all, the upstart British brand is best known for budget Hi-Fi. The Concept 300 is definitely not cut from frugal cloth. In truth, this isn’t the first time Q Acoustics has pushed the boat out. The Concept 300 is a stablemate to 2017’s Concept 500, a high-end floorstander produced as a technology statement. This model builds on that legacy. Everything about the Concept 300 is unambiguously premium. Although ostensibly a book shelf design, you’ll never get one in your carry-on luggage. Each piece weighs 14.5kg, and measures a substantial 220 x 355 x 400mm. The finish is gorgeous, more akin to high-grade furniture than sound system. Rather seductively, they mix real wood veneers with gloss lacquer. Our sample was white and oak, a sumptuous combination. There’s also silver and ebony, or black and rosewood, if you prefer. Whatever your choice, you’ll feel compelled to polish. Detailing is minimalist. A rear ported design, the speaker looks best with its magnetic grille removed. The drivers (a 165mm mid-bass unit and 28mm tweeter) are ingeniously free of bolt heads. This is because the squawker is actually locked in place from behind, held by spring-tensioned retaining bolts. The high frequency driver sits on an isolation mount (originally developed for the Concept 500), which allows it to nestle close to the mid-bass driver, all the better for time alignment. Rather than offer speaker support as an afterthought, Q Acoustics has designed the stand in sympatico. They’re sold as a single item and cannot be separated. It’s this symbiotic relationship which makes the 300 far more than a downsized 500. The tensegrity tripod stand comprises load-bearing aluminium rods and tensioned stainless-steel cable. The concept has been around since the fifties, but here Q Acoustics has adapted it to combat the transmission of vibration, both from the speaker and its local environment. The construction looks complex, but thankfully you don’t need to build it yourself. The stands arrive pre-assembled. Another benefit of this tensegrity construction is they largely negate the need for spikes. These are supplied if you want to use them, but they come with matching rubber boots if you’d rather not. The speaker employs Q Acoustic’s favoured Dual Gelcore cabinet construction. Gelcore is a liquid gloop that never sets, used to combat high frequency vibration. It works in conjunction with a novel isolation base suspension system. This forms the bottom of the Concept 300 cabinet, and further isolates the cabinet. The enclosure rests on four springs, damped using a material called Sylodamp. You can actually wobble the speaker, but the base and tripod remain fixed. Despite their obvious sophistication, these speakers are an unfussy install. A slight toe-in focuses the sonic image, but square on produces a slightly larger soundstage. It’s a matter of choice. Given that there’s very little sacrifice, running them forward-facing was our preferred default. The speakers were parked about a metre from a back wall. So does Q Acoustic’s inspirational, clinical approach to industrial design deliver when it comes to sonic performance? You betcha! Coupled with some (humongous) QED Supremus speaker cable, and driven by Pioneer ICEPower Class D amplification, I quickly discovered the Concept 300 sounds every bit as elegant as they look. American Beauty, the fifth album from The Grateful Dead (24-bit 96 kHz) perfectly illustrates their breezy, nimble delivery. This collection of jangle pop rock is beautifully, naturally delineated. Jerry Garcia’s lead guitar sounds positively three dimensional. Similarly, Friend of the Devil is bright and warming, while the sweet vocals of Candyman surge like Santa Barbara surf. The Overwatch soundtrack (CD) allows the speaker to exercise a different muscle. Fusing electronic, acoustic and orchestral themes, it’s a rollercoaster suite that confirms this stereo pair can sound properly epic when required. Temple of Anubis has a deep driving bass riff, here given great heft and weight. That extra cabinet depth really allows them to drop low (although floorstanders with a comparative footprint could probably reach deeper). These speakers open up and engage, bristling with energy. The modern jazz of HYPS Chaotic Planet (SACD) anchors these speakers in their comfort zone. Featuring speed percussion with massive transients, the drivers align perfectly for staccato drumbeats that land like jabs to the jaw. 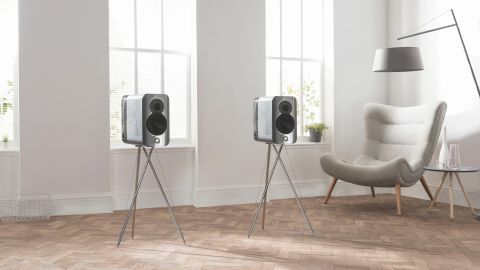 That tensegrity stand and Isolation Base combo lend these speakers a taut purity which is intoxicating. This fresh vigour can also be heard the slightly off-kilter harmonies of If I Fell, from the remastered Hard Days Night (24-bit FLAC). They reveal almost granular detail in Lennon and McCartney’s classic. Had the Fab Four ever pitched up in my living room, I suspect they would have sounded much the same. Q Acoustics has produced something glorious here. Combining iconic style with a transparent, rewarding sonic performance, the Concept 300 don’t sit in judgement of musical taste. They don’t care that I want to listen to One OK Rock. They just offer unconditional listening. Despite their size, the Concept 300 is also surprisingly interiors-friendly (a trick not to be sniffed at). Much of this is down to that unusual tripod stand. After a while you tend to look straight through it; the speakers almost seem to float. It’s not often in the world of Hi-Fi you experience something wholly original. The Concept 300 may build on classic sonic principles, but the result is fresh and new. Audition as a matter of urgency. Up your audio game in every way with our round-ups of the best portable DACs and best over-ear headphones.